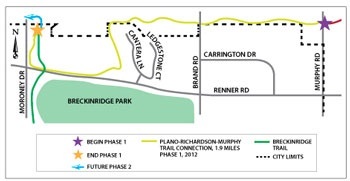 The City of Plano is partnering with the City of Richardson to plan and construct a 1.9-mile trail that would wind through Richardson to connect an existing trail in southeast Plano to the Timbers Nature Preserve Park in Murphy. The trail is completely funded through the City of Plano’s bond program. The City of Richardson would provide the land and future maintenance of the trail if the City Council approves an Inter Local Agreement at a future meeting. The trail is proposed to be built in two phases, with Phase 1 running from the west side of Murphy Road within an Oncor high transmission line corridor to the existing trail on Rowlett Creek in Breckinridge Park. Construction on this part of the trail is expected to take place in 2013. Phase 2, which is currently unfunded, would connect Rowlett Creek to Otto Middle School. The City of Plano hopes to receive a grant from Collin County to pay for additional trail length, which is set to be constructed in the next two to three years. Watch the work session presentation at http://bit.ly/Pr38zq. This is great! I hope to live long enough to have this area fully connected by trails so that when I a doddering old man, I can dodder along the bike trails of Plano and Richardson! Unfortunately, there isn’t anything yet, connecting Richardson and Plano. There is, however, a path under the high five going to Dallas. Hmmm, the Garland trail system will have its first inter-city connection with the trails at Breckenridge… Actually Garlnad won’t even have a “system” at that point, just a series of trails and bike lanes that run from Mesquite to Breckenridge Park.